In Windows, mouse settings are controlled by using the Mouse Properties dialog box. To display that dialog box to change mouse settings, open the Control Panel Home and choose the Mouse link beneath the Hardware and Sound heading. 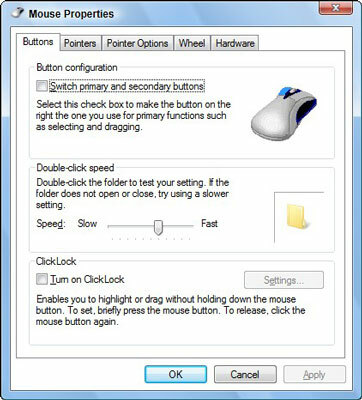 From the Control Panel Classic view, double-click the Mouse icon to see the Mouse Properties dialog box, as shown in the following figure. Control your mouse’s buttons using this dialog box. If you can’t seem to double-click, one of two things is happening: Either you’re moving the mouse pointer a little bit between clicks, or the double-click rate is set too fast for human fingers to manage. The double-click rate is set in the Mouse Properties dialog box, on the Buttons tab in the Double-Click Speed area. Practice your double-clicking on the tiny folder icon off to the right. Use the Slow-Fast slider to adjust the double-click speed to better match your click-click timing. The Pointer Options tab in the Mouse Properties dialog box, as shown in the following figure, contains a number of options to help you locate a lost mouse pointer. These options can come in handy, especially on larger displays or when the mouse pointer is floating over a particularly busy desktop. 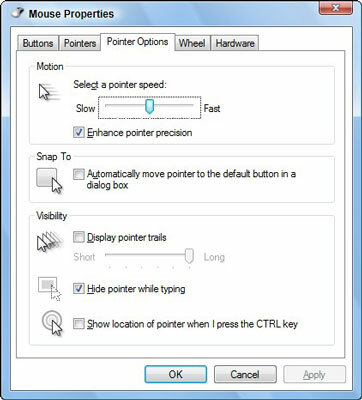 Control your mouse’s pointer using this dialog box. The Display Pointer Trails option displays a comet trail of mouse pointers as you move the mouse about. The Ctrl key location option allows you to find the mouse pointer by tapping either Ctrl key on the keyboard. Finally, you can employ the Snap To option, which specifically jumps the mouse pointer to the main button in any dialog box that appears.